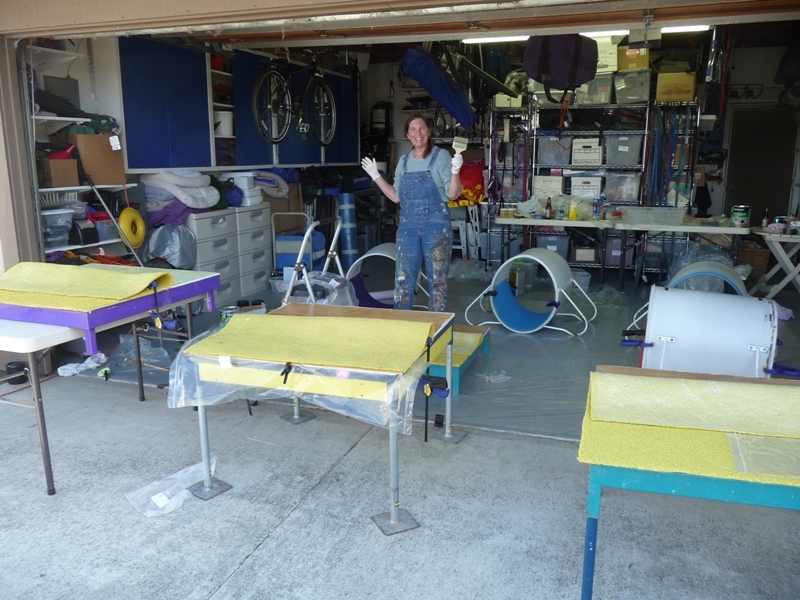 Recently, some friends and I gathered at my house to make and mount Rubber on the Run skins on all of the chutes and tables belonging to our agility clubs – Bay Team and SMART. We leveraged some of the lessons I learned while making my own the previous weekend. But this was the first time we dealt with the final phase of the operation – gluing the skins on the equipment and trimming it. Here are the lessons we learned during this phase. This is the fourth installment in my saga. I’m assuming that you have a copy of the book (“Making Rubber Skins for Agility Equipment“) or it won’t make much sense. The process of gluing and trimming was actually pretty straightforward, once we learned Most Important Lesson #1: The book recommends using DAP Weldwood Original Contact Cement (red label). It also mentions that the Nonflammable version (green label) would probably work too. Don’t believe it. It doesn’t. Period. Don’t waste $35 (and your dog’s safety) trying to be “green” – we already did that for you. 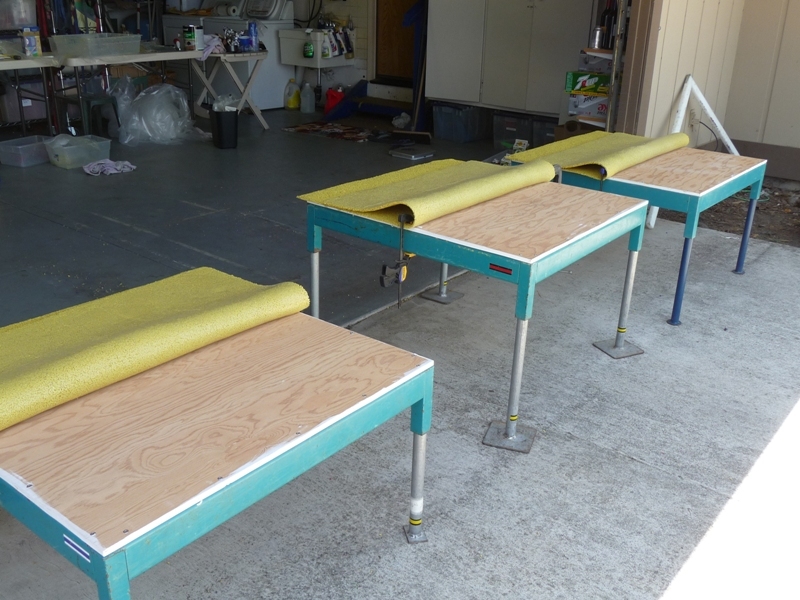 We had actually finished all of the tables and were hoping for the best when we started on the chutes (with their curved surfaces) and realized the stuff was hopeless. Once we converted to the good stuff and saw how well it worked, we decided to redo the tables. Here’s how ineffective the other stuff is: despite having cured on the tables for a couple of hours, the skins still peeled off with the resistance of a post-it note. In contrast, when you set the mats with the good stuff, you had better get it right the first time because it isn’t coming off, ever. The book suggests trimming the skins after mounting with a utility knife, and also suggests swapping blades often. I hate utility knives – I’m scared to death of them. And I just had a sense that the effort required to cut something that was going to dull the blades so quickly had real potential to turn into a bloodbath for me. So I tried something else – a tool that I’ve often used for trimming foam rubber and memory foam – my mother’s old electric carving knife from the ’70s. SUCCESS!!! It cut the rubber like butter and left a perfect edge. No fuss, no muss, no blood. It was so impressive that I made a video. You can still get these knives, but be sure to get a two-blade model – that is the secret ingredient. I’m pretty sure a single-blade one would just bind up on the rubber. If you’re not as lucky as I was and don’t still have the one that thrashed many a holiday turkey in your youth, I think you can still get them. For instance, the Cuisinart CEK-40 appears to come with the right blades. As suggested in the book, we used clamps and glued half of each table at a time. This way, the mat is already positioned correctly, which is extremely important because you really can’t reposition when you use the good contact cement. Don’t waste your time with a 2″ brush. The cement is goopy and sets up quickly. So the more space you can cover, the better. We used a cheap 4″ brush (as modeled here by Celeste Thomas, master gluer). The other important thing that isn’t mentioned in the book (but is visible in the last photo) is to protect the other half of the skin when you are applying the contact cement. You can see that we have inserted plastic sheeting between the two layers to avoid getting cement on the wrong piece and having them get stuck together. This entry was posted on Saturday, July 10th, 2010 at 9:55 am and is filed under Rubberized Contacts. You can follow any responses to this entry through the RSS 2.0 feed. You can leave a response, or trackback from your own site. Thanks for the tip on using an electric knife to trim. It works very well and cuts like butter.